Early this summer, we explored Columbia and its immediate environs during the half of the 24/7 cycle when most of us sleep. From an outdoor slumber party in southwest Columbia to the first light of day at the Foremost Dairy Research Center west of town, we met up with a few of our Columbia neighbors going about their “days” from dusk to dawn. Come along for a glimpse of the other half of what makes CoMo a great place to live, work and have fun. What says summer sleepover better than a campfire, s’mores and glow sticks? These parents (who asked to keep a low profile for their kids’ sake) invited friends and family over for an impromptu slumber party in their yard that abuts the woods. Still on the young side for an overnight, most guests went home before midnight chimed, but the dad and his three children camped out overnight for a memorable adventure just steps from their front door. “I have such great memories of sleepovers,” mom Megan says. “It’s always time out of the ordinary, when you can stay up extra late, eat those extra treats, play games and talk deep into the night.” A movie and popcorn complete the fun until eyelids flutter and heads begin to nod. The Twin Oaks Sports Center gets a workout as the home of the BC Baseball League, a competitive league, fielding 51 teams — age 8 and younger through 14 and younger. About 500 competitors and 150 to 200 coaches come from as far away as Sedalia and Montgomery City. Each team will play as many as 70 ballgames during the April through June season. Double-headers most Monday through Thursday nights and weekend tournaments are the norm. The league’s executive director, Steve Reller, has played and coached baseball and watched two sons grow up to play college ball and coach, but he never tires of the magic of night games. “Every kid thinks they’re a major league player when they walk out on a field under the lights. It’s always something special, whatever age you are,” Reller says. Shauna Marquardt tracks bats. A biologist with the U.S. Fish and Wildlife Service’s Missouri Ecological Services Field Office, Marquardt uses mist nets and ultrasonic bat detectors to find and study these winged mammals during the summer survey season. Some nights, “you might only catch one or two, and the bat detectors are very quiet. At other times, the detector is chattering constantly,” she says. The information on location, colony sizes, reproductive condition and disease helps federal and state conservation agencies protect colonies — with the goal of being able to get species off the endangered list. “There is something exciting and mysterious about working in the dark. The nighttime is peaceful, yet fully alive with sights and sounds not experienced during daylight hours. Bats and bat biologists get a very different perspective of nature compared to other animals who are awake and active when the sun is up,” Marquardt says. David McDonald’s “Eureka!” moment came in Scottsdale, Ariz., as he boarded a free downtown shuttle a year ago last April: “Why not Columbia?” he thought. 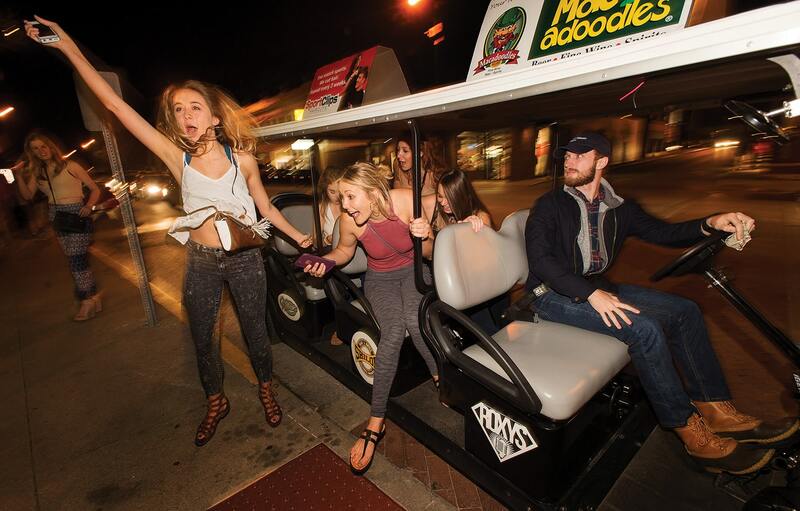 Four months later, he’d launched Mac Daddy Lyfts, four “stretch” golf carts that tool around downtown on weekends. The service is complimentary, although tipping is expected. But if McDonald or his drivers see someone walking alone at night, they’ll call out, “Hey, climb on board” even if they can’t tip. 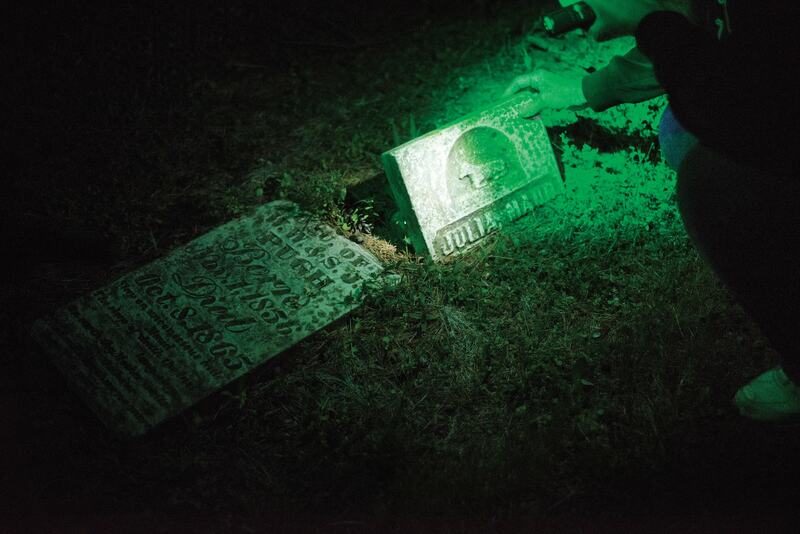 Store manager by day, ghost hunter by night, John D. Jones prefers the title, “paranormal investigator.” With co-investigator (and fiancée) Karen Tuggle and research partner Sara Esse, Jones has completed 100 investigations since launching CoMo Paradigm about three years ago. Intrigued by unexplained phenomena since childhood, his curiosity piqued into an avocation 13 years ago when he moved into a Columbia home that seemed, well, haunted. “I feel skittish sometimes about telling people what I do,” Jones says. “You always run the risk of people thinking you’re not for real or you’re crazy.” But he adds, he’s experienced enough to put him squarely in the not-so-skeptical believer camp. People find him on Facebook or by word of month. Every investigation starts with a protection prayer and a detailed three-page questionnaire he goes over with clients. It’s another Friday night for Columbia Police Officer Clint Sinclair who, along with Officer Mark Hoehne, makes up the DWI Unit on weekend patrol. “I can make anywhere from five to 15 stops a night, depending on traffic flow, special events and when students are in town,” says Sinclair, who estimates he’s investigated and arrested about 100 alcohol- and/or drug-impaired drivers in his six years with the Columbia Police Department. You know the type, that sassy waitress with a heart of gold? Meet Esther McCune. 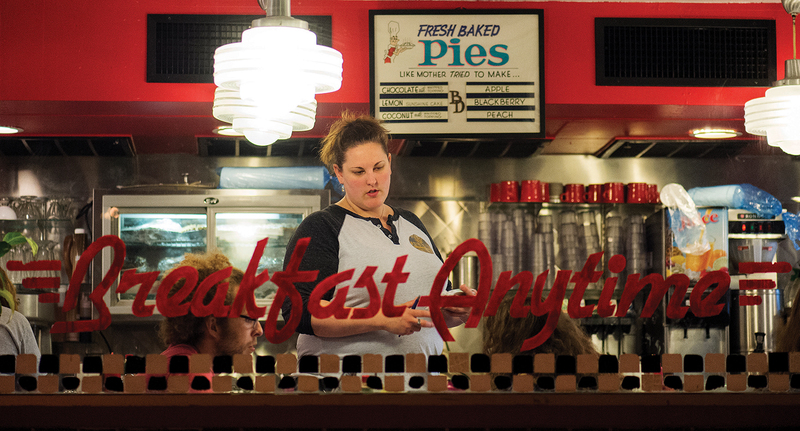 She’s waitressed on and off for 15 years — the last five at the Broadway Diner — putting herself through school. She works 11 p.m. to 6 a.m. Tuesdays through Saturdays — as well as Friday and Saturday mornings, cooking and scheduling, too. It beats 12-hour overnight shifts driving a cab, she says. Her regulars — restaurant workers and bartenders on their way home — like that she knows their favorites. Students pulling all-nighters appreciate the bottomless cup and good cheer. The drunks? “They kind of entertain me,” she says. And they apparently appreciate her. One came in one night when she was off and was inconsolable until they called McCune to talk with him over the phone. Highway driving might be one never-ending pileup without Missouri Department of Transportation night crew leader Steve Galen and his team of three. 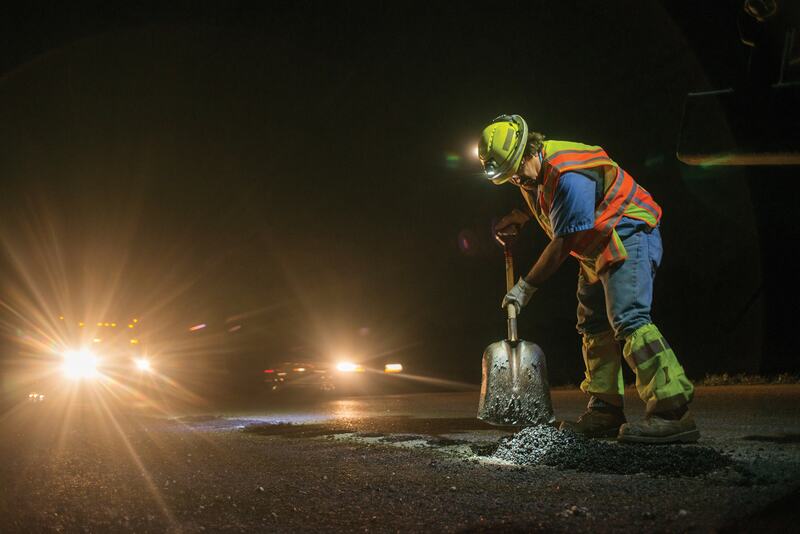 From 8 p.m. to 6:30 a.m. Mondays through Thursdays, they “slow roll” mainly along Interstate 70 and U.S. 63 in Boone County, fixing potholes, flushing bridges and tending to lesser repairs, making sure the roads are ready for the daytime traffic ahead. A TMA (Truck Mounted Attenuator) truck with its big flashing arrow guards their rear. “It takes a while, but after about two weeks, you get used to it,” says Galen about working nights. “You see less and are more focused on what’s right in front of you.” Or what’s above. “That book got me into earnestly baking,” says Rottinghaus, Uprise Bakery’s owner and head baker. “… that you didn’t just have to make one kind of bread from sourdough … that all your bread can be made from natural leavening.” This was a revelation to Rottinghaus whose first baking experience involved making pizza dough at “Shakes” (Shakespeare’s Pizza) and tasty but more commercial quality bread at a bakery in Telluride, Colo., where he landed for a few years before returning to Columbia and eventually helping to co-found Ragtag Cinema. 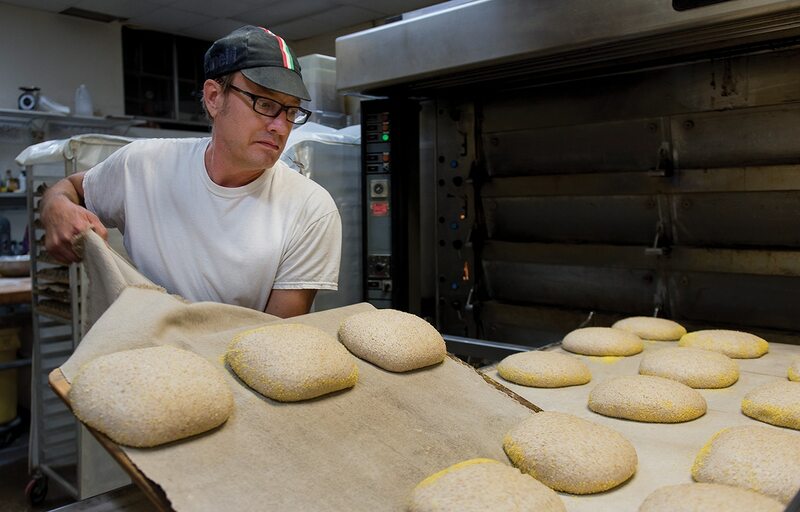 The process that explains the rich tastes and textures of Uprise breads is also “the ball and chain about natural leavening,” Rottinghaus says. “You have to take care of your culture because it’s alive,” requiring a team to provide round-the-clock monitoring, care and feeding. Ronald Mitchell — the lone street sweeper on the downtown 3:30 a.m. to noon shift, Monday through Friday — is a self-described neatnik. For the last eight years, this lifelong Columbian has cleaned downtown streets after the rowdies head home. “I like seeing the way it makes things look after I’m through,” he says. From high up in the cab of the towering Pelican, Mitchell patrols a realm of litter and leaves. Responsible for streets roughly bounded by Boone Hospital Center, College Avenue, and Ash and Garth streets, he says the downtown bar scene always demands extra attention. 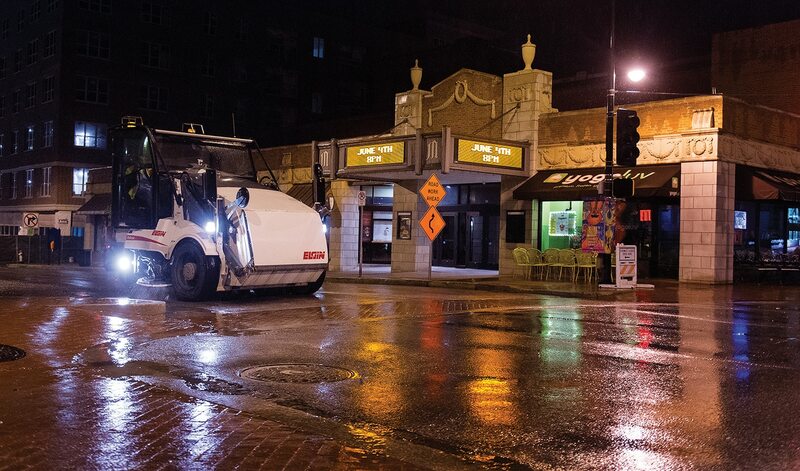 Mitchell expertly nudges the swirling gutter broom against the curb, pulling debris onto a conveyer belt that empties into a front hopper — as many as three 2- to 3-ton loads some nights. Mitchell climbs down from the cab often, meticulously sweeping up any glass shards and cigarette butts left behind. The next time you’re standing in front of the display case at Harold’s Doughnuts, overwhelmed by the tasty choices that beckon, thank Grace Lechiara, Scott Jost, general manager Amy Winschel and Katlyn Renee. Lechiara starts the process about 1 a.m. — prepping the old-fashioned dough. An hour later, Jost arrives to start frying. Winschel and Renee start decorating at the relatively civilized hour of 4 or 5 a.m. Glazed, frosted, sprinkles, bars, twists, Long Johns, rings, Boston creams and more — all deserve a final sprucing on their way to one of the 12 trays — with backups at the ready — that have to be filled and in place when the doors open at 6 a.m.
Winschel started as Harold’s graphic designer until “I just kind of fell in love with the whole ‘love your craft’ concept” and started making doughnuts, too. Her grandmother worked most of her life in a doughnut shop in Perryville. “There were always treats at Grandma’s house” — maybe part of the inspiration. 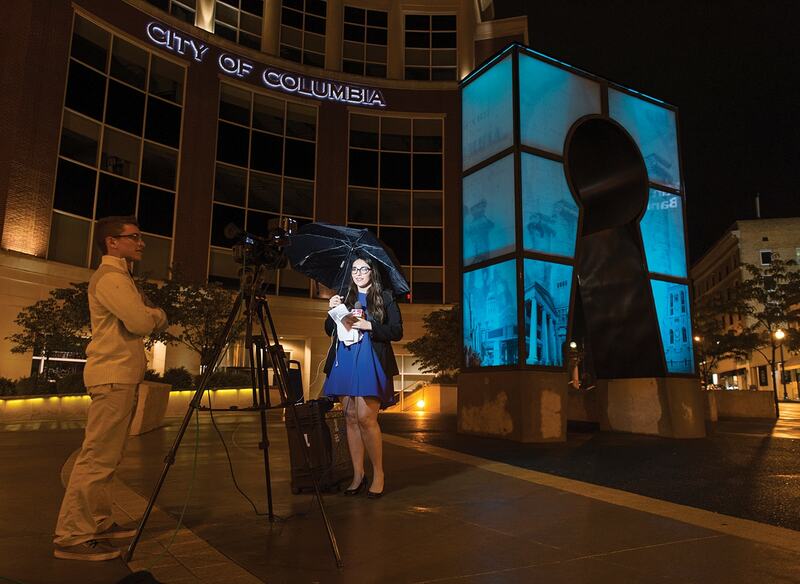 As they wake up with the rest of Columbia from 4:30 to 7 a.m., the KOMU-TV 8 “News Today” morning reporters almost always go live on location — like Nina Amedin doing her standup at the City Hall breakfast station during Bike, Walk and Wheel Week. 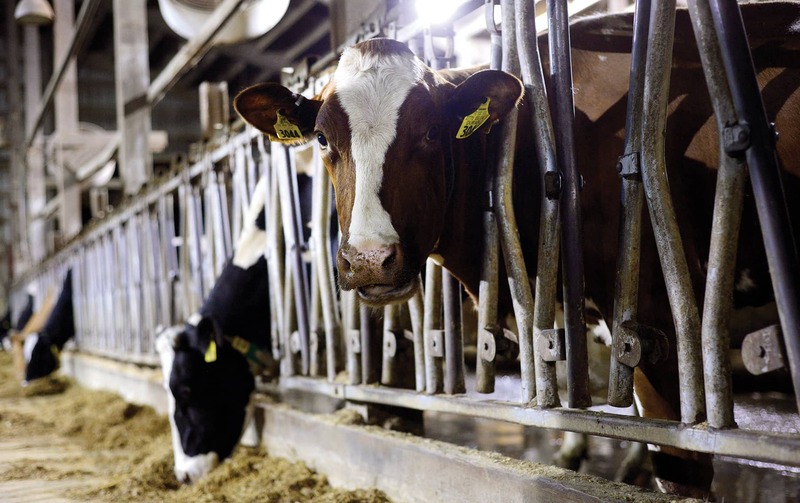 Every day, the 200 Guernseys and Holsteins at the Foremost Dairy Research Center head to the “pits” for milking — at 4 a.m. and again at 4 p.m. Another 250 or so calves and nonlactating cows have to be fed and tended to — as well as the usual farm chores of fences to mend and grass to mow — all done by five full-time staff and eight to 12 part-time students at this University of Missouri dairy operation about nine miles west of town. Much of the milk, marketed through the Dairy Farmers of America, ends up in Central Dairy products. “I love this job,” says Katelyn Adams, an animal science major and former Future Farmers of America dairy judge from Lee’s Summit.